Supplied: In five litre containers of peat free compost, healthy and well established, approximately 120cm (4 feet) high, with full planting and aftercare instructions. 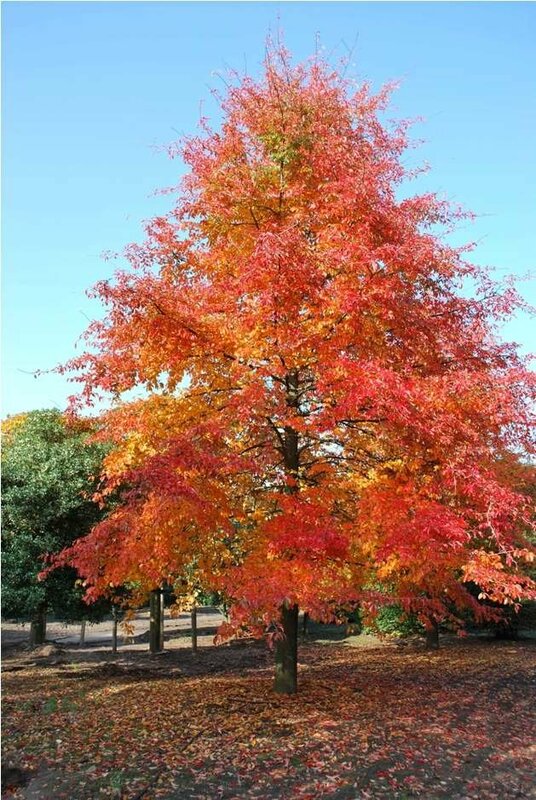 Nyssa sylvatica is a splendid shade tree with a pyramidal habit and famous vibrant autumn color. The generic name refers to the beautiful Greek water nymph Nyssa, while sylvatica is Latin and means “of the woods”. Nymph of the Forest - lovely. This North American native has numerous attractive qualities but first and foremost is the unrivaled autumn colour. This unassuming species has become a connoisseur’s choice and the secret to its attraction lies in its glossy leaves which produce some of the brightest and most reliable displays of the season which few others can match. There is however much more to this tree than simply the most blazing red foliage imaginable. Tupelo's appeal is greatly enhanced by the handsome glossy foliage which remains good looking all summer long. As it ages, the branches become more horizontal to drooping, which enhances the winter interest. There are the small flowers, which bloom in spring and are the origin of Tupelo honey. Finally it’s wildlife friendly as the birds would thank you for planting it as they relish the small, bluish fruit which begin to ripen in late summer and autumn and are somewhat prominent. A native of lowland places in the eastern half of North America its native range is from Canada to the Gulf of Mexico, which covers an immense variety of soils, temperatures and precipitation. So, it’s no surprise that it’s tolerant of most conditions throughout the temperate world including pollution, seaside conditions and compacted, urban soils. The most vigorous growth, however, will occur when it is grown on slightly acidic, moist, humusy soil. Young trees may require regular watering until established, then they will be more drought-tolerant. Reaching an ultimate height of 10-15 meters it is suitably sized for most gardens, casting a light shade that is easy to garden beneath. Fully hardy.